• 98.4% of the construction waste was diverted from the landfills. • 96% of the shell and structural components were retained. • 52% reduction in water consumption • 12.5% of the total value of materials have post-consumer and pre-consumer recycled content. 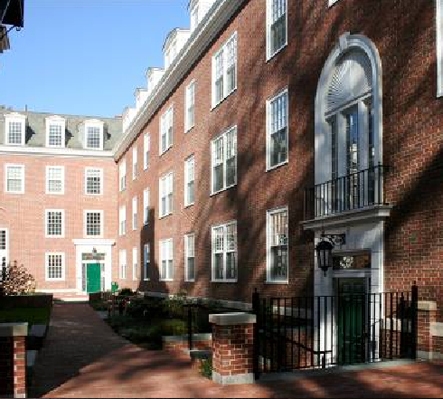 Gallatin Hall is a 48,218 square foot, four story residence hall located on the Harvard Business School campus at 24 Harvard Way in Boston, MA. The original 1927 Georgian Revival building was designed by McKim, Mead and White and completed as a part of Charles McKim and Frederick Law Olmsted’s competition-winning HBS master plan. The renovation of Gallatin Hall included a pre-design, programmatic study to determine the most productive and best use of the building. The program called for decompressing the bedroom space by recapturing common space and non-residential space. Although the exterior was left largely in its original state, it required a complete restoration. The building infrastructure (HVAC, tel/data connections, elevator, etc.) was replaced with more energy efficient systems. Throughout the project, the team consistently analyzed materials and systems that were both sustainable and stylistically appropriate, in order to pursue LEED-NC Gold certification.